Written by Stephanie Kwan, student in the Health Law and Policy Clinic, Fall 2018. Lung cancer kills more West Virginians than breast, prostate, and colorectal cancers combined. On November 1st-2nd, 2018, CHLPI joined hundreds of health and policy leaders at the Second Annual Lung Cancer Conference: Catalyzing Change to Address Lung Cancer. 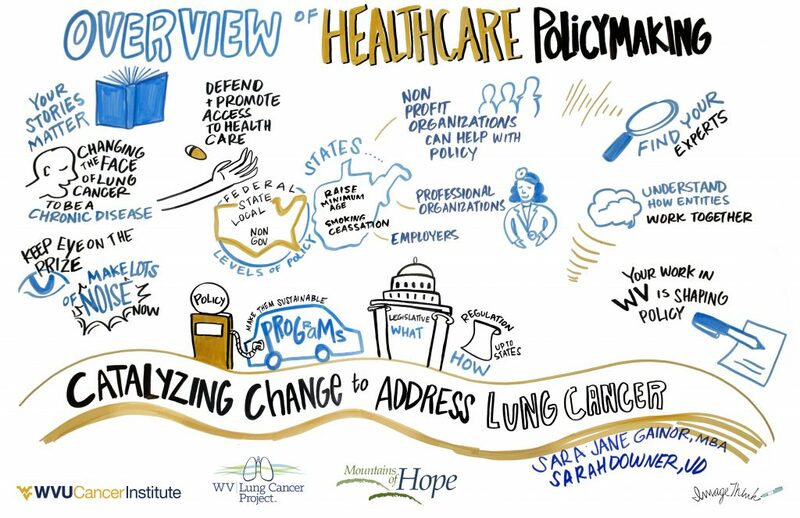 Hosted by West Virginia University Cancer Institute, the Mountains of Hope Cancer Coalition, and the Patient Advocate Foundation, the conference saw more than 200 health and policy leaders gather at the WVU Erickson Alumni Center in Morgantown, WV to address lung cancer policy changes. The conference was designed to raise awareness about the impact of lung cancer across West Virginia and to identify avenues to improve lung cancer screening, early detection, treatment, and survivorship. The two-day program engaged healthcare providers, community-based health workers, public health educators, advocates, and policy makers in implementing changes both in their local communities and on a statewide level. 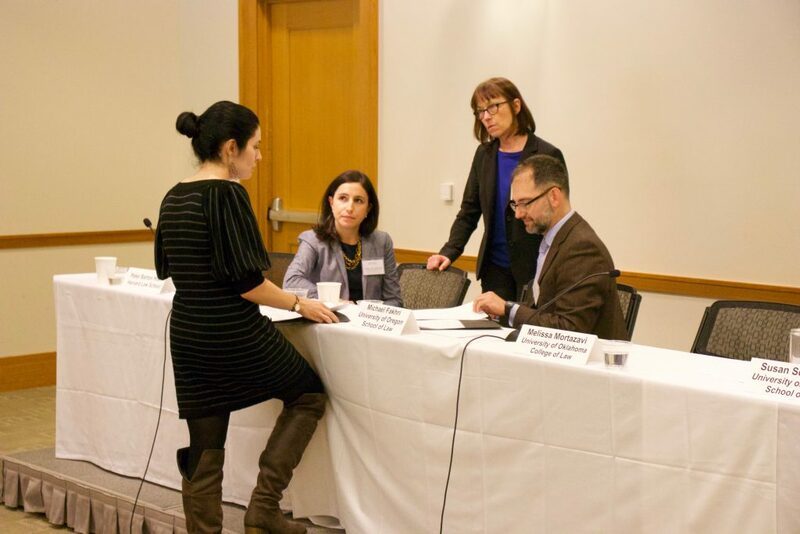 Sarah Downer, CHLPI’s Associate Director for Whole Person Care and Clinical Instructor on Law in the Health Care and Policy Clinic, along with second-year clinic student Stephanie Kwan, welcomed conference attendees with an overview of healthcare policy-making. The overview discussed policy formation and how advocates could work with various entities to effect change. “Even though systemic changes take a long time, keep your eyes on the long term prize and don’t stop telling local policy makers your stories, because your work in West Virginia matters and is shaping national healthcare conversations”, said Sarah. Graphic documentation of CHILPI’s presentation on “Overview of Healthcare Policy-making”, illustrated by Nora Herting. West Virginia Delegate Amy Summers, Vice-Chairman of Health and Human Resources Committee of WV House, who not only is a nurse but also has a long family history of cancer, reminded attendees to get to know their legislators. Doing so will allow advocates to understand the expertise, priorities, and passions of their representatives, which will help advocates tailor their policy goals and approaches. Attendees also heard from West Virginian experts; Dr. Christopher Plein, Professor at the Department of Public Administration at West Virginia University, highlighted the historical roots of many contemporary healthcare issues, while Dr. John Deskins, Director at the Bureau of Business & Economic Research at WVU College of Business and Economics, discussed the economic costs of lung cancer in West Virginia. 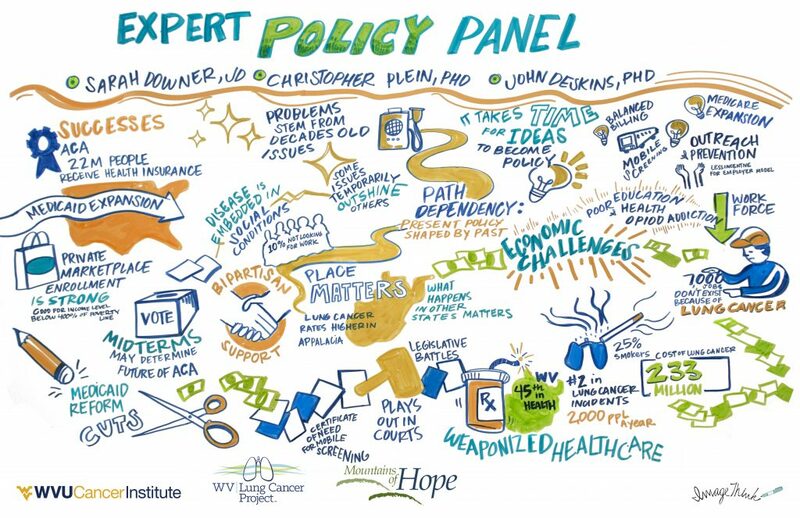 Graphic documentation of the expert policy panel that comprised of CHILPI’s Sarah Downer, Christopher Plein, and John Deskins, illustrated by Nora Herting. Dr. Camara Jones, Senior Fellow at Morehouse School of Medicine and a Past President of the American Public Health Association, addressed the crowd on social determinants of health, including poverty, racism, and institutional disparities that are often ignored by today’s healthcare system. Following the presentations, conference attendees participated in an interactive policy planning session, identifying local advocacy goals such as rescinding no-smoking ban, establishing primary care partnerships, and engaging insurers to pay for screening. Attendees also examined specific programs that effect lung cancer in West Virginia, including Medicare and Medicaid, lung cancer treatment case studies, opioid Rx regulations, as well as immunotherapy and the use of robotics in surgeries. Another highlight of the conference was the Shine A Light on Lung Cancer evening reception, where speakers and attendees came together to honor lung cancer survivors, family members, caregivers, and those who have passed. The two-day event was a highly successful initiative that brought together policy leaders and healthcare practitioners to learn, plan, and act. The conference equipped attendees to be advocates in their respective professions and communities. It was an eye-opening experience for clinic student Stephanie to speak to experienced practitioners and to witness how practitioners could work on policy goals that make a difference in the lives of people they serve. 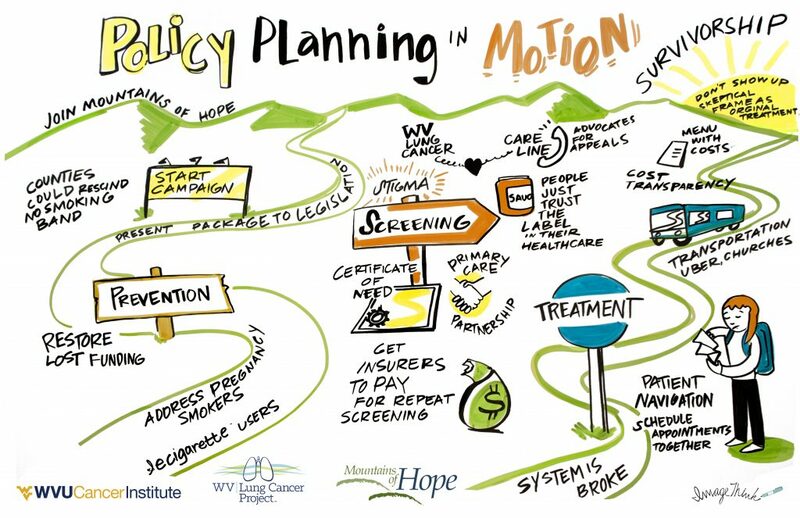 Graphic documentation of “policy-planning in motion”; produced collaboratively by conference attendees and illustrated by Nora Herting. 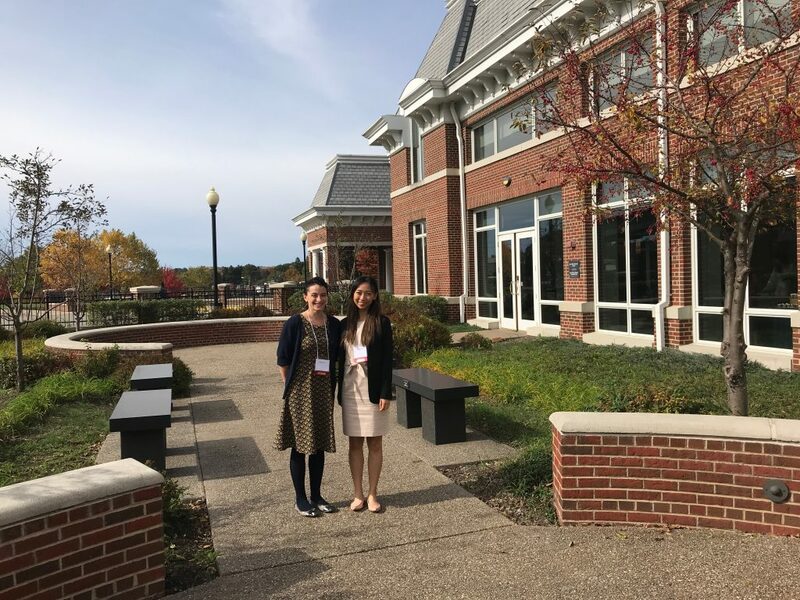 Sarah Downer and Stephanie Kwan at the WVU Erickson Alumni Center in Morgantown, WV, speaking at the Second Annual Lung Cancer Conference. Written by Erika Dunyak, FLPC Clinical Fellow and AFLP Conference attendee. 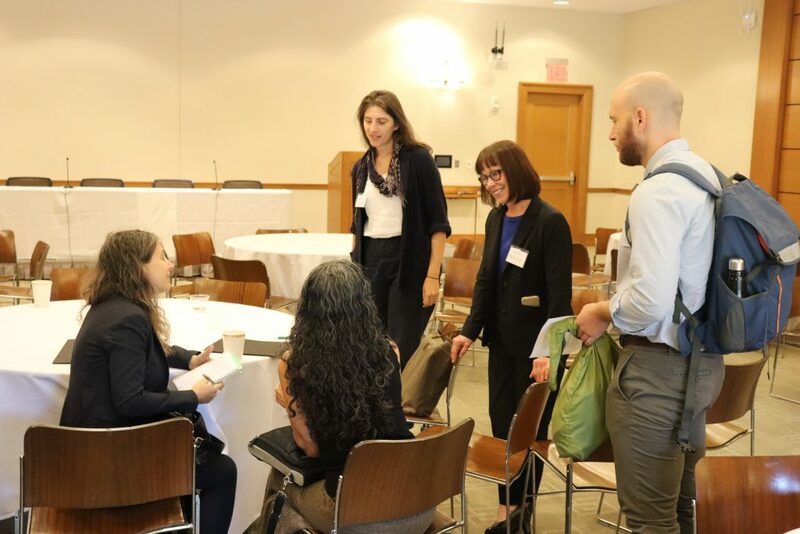 On October 5th, 2018, the Academy of Food Law and Policy (AFLP) held its inaugural conference at Harvard Law School, co-hosted by Harvard Law Food Law and Policy Clinic (FLPC). The conference welcomed over 40 attendees and featured a series of workshops, moderator-led discussion groups, and a lunchtime panel led by past and current AFLP board members. The conference connected the food law and policy community and highlighted parameters of the field through group-driven discussion of scholarship, teaching, and growth of the AFLP. Championed by Emily Broad Leib, director of the Harvard Law Food Law and Policy Clinic and Susan Schneider, director of the LL.M. Program in Agricultural & Food Law at the University of Arkansas, AFLP seeks to stimulate intellectual discourse, encourage and recognize scholarship, enhance teaching, support student interest, and promote the academic field of food law and policy. Now in its second year, the Academy connects legal faculty from across the globe to create a foundation for the long-term stability of food law as an academic discipline. As a conference attendee, it was refreshing to be among peers and mentors in the food law space. Academy members gathered to evaluate and labor over each other’s writing in hopes of contributing meaningfully to academic discourse. The conference’s workshops helped attendees develop their positions and find new angles and new resources to strengthen their work. It was an exercise without judgment, and most importantly, will improve the research and writing of authors contributing to the food law academy. Some AFLP members are adjuncts, teaching in undergraduate programs, clinical professors, or other non-traditional academic roles for the doctrinal legal academy. Other members are tenured faculty; the Academy even counts a dean amongst its members! But at the conference, the traditional academic barriers that exist were broken down; attendees were eager to learn from one another. Conference attendees also noted actions to increase inclusivity as an exciting next step for the legal academy and the future of food law. The inaugural AFLP conference signals the expansion of this burgeoning field and exciting opportunities on the horizon for legal scholars.